IIT Kanpur has announced the result of JEE Advanced 2018 on 10 June. Candidates who appeared for JEE Advanced entrance test on 20 May can download the result. To check JEE Advanced result 2018, enter registration number, date of birth, mobile number and email ID as registered in the application form. Candidates must verify their names, marks obtained in each subject, total marks, JEE Advanced AIR, JEE Advanced category rank. Aspirants securing the minimum qualifying percentage of marks in JEE Advanced are considered qualified. This year, Pranav Goyal topped the exam with 337 marks out of 360 while Meenal Parekh topped among the girls with AIR 6. JEE Advanced 2018 is the basis for admission to around 11,000 seats in 23 IITs. As per the latest information, 291 seats have been increased in IITs for admission to the academic year 2018-19. 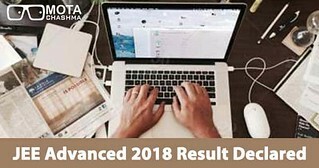 How to download JEE Advanced 2018 Result? Following is the procedure to download JEE Advanced result. Following are the details which must be verified by the aspirants. The result of JEE Advanced 2018 has been announced only for the aspirants who have appeared for both Paper 1 and 2. Marks obtained in JEE Advanced Paper 1 and 2 are considered for calculation of rank by the concerned authorities. The rank list of JEE Advanced 2018 has been prepared on the basis of aggregate marks secured in the entrance examination. All the qualified candidates included in the rank list can register for JoSAA counselling, which will begin from 15 June 2018. Aspirants will be required to enter their preferences of colleges as well as courses for admission into IITs. The seat allotment will be done on the basis of rank, choices filled and seats available.